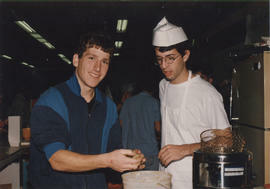 Photograph depicts two unidentified youths preparing food. 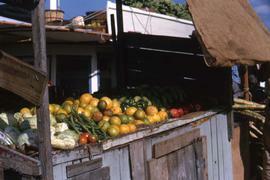 Colour Kodachrome 35mm slide depicts a fruit stand. Colour Kodachrome 35mm slide depicts a group of men surrounded by bananas as well as a boat full of bananas on a roof behind them. Oral Interview with Hazel Stevens. Interviewed by Alisa Lazear and April Thompson for Feeding Community podcast.